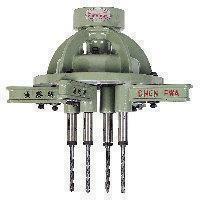 The multi-spindle head is offered by Chen Fwa, a Taiwan based manufacturer of drilling and tapping machine. The heads are designed for most of the drilling machine, and the application is to double or triple the drilling for the drilling countersinking, reaming or tapping two or more holes in one operation. Thisi mutiple spindle head is quality made, and it provides great precision as well as firmness for your work. We have a professional R&D team working on improving the quality of the multi-spindle head for drilling equipment. We believe that every little element for the machine is crucial, so the durability is the top priority while manufacturing. If you are interested in our cutting machine accessories, please do not hesitate us for more information about the multi-spindle head for your drilling machine!